The one thing I always remember about Lufia II is the bushes. See, there's this one dungeon near the end of the game where you have to figure out how to slash down a whole bunch of tufts of grass, but every time you make a move, a bunch of those bushes regenerate. With crafty use of your bush-destroying items—your sword, your flame arrows, your bombs—you can clear them all at once. But it takes a crapload of trial and error, and it nags away at your brain for a few minutes. When you do finally pull it off, all that frustration immediately disappears. Catharsis! The best way to describe Lufia II might be "a cross between Final Fantasy and Zelda, with way more puzzles." The structure is rigid: you, the Hero, adventure across the world in linear fashion, going from town to dungeon ad infinitum until the game ends. Conveniently-placed guards and other obstacles ensure that you can only go where the story wants you to go, and by the time the world opens up toward the end of the game, you've already seen almost everything. And then there are the puzzles. I've been replaying Lufia II for our Grand Summer JRPG Adventure, and the one question I keep asking is: why don't other RPGs have puzzles like this? Instead of just throwing mazes and monsters at you, dungeons in Lufia II challenge you to think about what you're doing, where you're going, and even how many steps you're taking. Some of the puzzles are obvious—put this jar on a button—but as you progress through the game, they get increasingly difficult, until you get to tons of tricky, deliriously fun puzzles like the Never-Ending Bushes. There's even one optional task called The Most Difficult Puzzle In The World (though it probably isn't). Lufia II is also smart in how it makes movement matter—enemy encounters are displayed on screen, but those monsters will only move when you move, in a mechanic reminiscent of the original Rogue. (There's even a 100-floor dungeon called Ancient Cave that offers procedural, Rogue-like dungeon-crawling.) Different monsters have different behavior sets—some move fast, some move slow, some chase you, etc. To get through each dungeon, you have to both discern these monsters' patterns and figure out whether you want to fight or avoid them. Sometimes, you have to actually use monsters in puzzles, maneuvering them around the room and trying to get them to stand on switches or fall into traps. 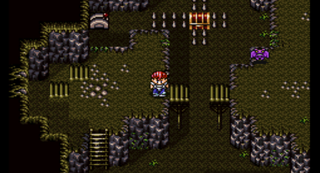 Really, I wonder why more RPGs haven't given their dungeons the type of elegance and intelligence that Lufia II had. It's a shame other Lufia games didn't follow suit, either. What do you think of the dialogue? Isn't it neat how every character has their own little "voice" that takes the form of different "beep" octaves when they talk? Dekar: great character or greatest character? What's up with Maxim and Selan taking a yearlong break from their adventure to get married and have a kid? Weird pacing choice or ballsy, innovative move? Anyone get far enough to see this infamous screen? Remember, next week we're gonna discuss Soul Blazer, a game about talking trees.